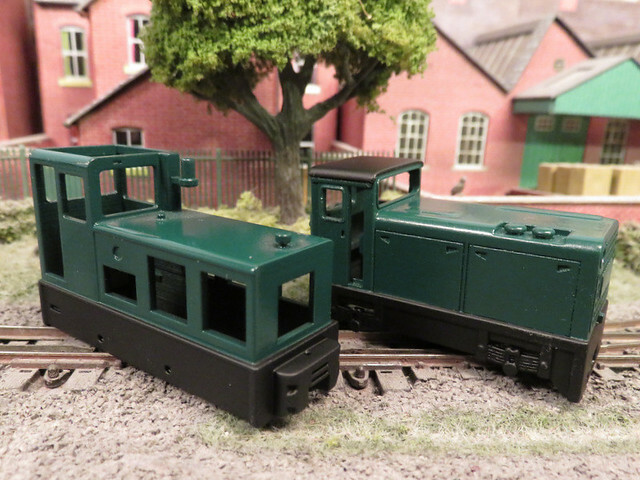 I have been making slow progress over the last few months with two 3D printed Diesels, a Narrow Planet Baguley-Drewry and a CWR Hunslet, both as used at RNAD depots. I was keen to get a good surface finish so spent much time with fine emery paper, then a coat of primer, more rubbing down, this was repeated 4 or 5 times until I was happy the print lines were gone. These were both good quality prints, but the effort in surface preparation is worthwhile. 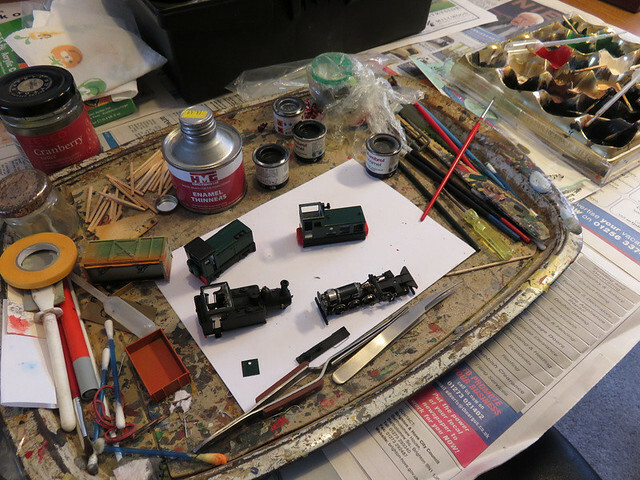 The recent fine weather was a good chance to spray with the top coat - I chose Halfords enamel dark green, as I've used for other locos, and looks rather smart. The rattle cans give a good finish with little effort, so I decided to spray the black frames and roof too. This is the first time I've used masking to spray different colours, and I was very pleased with the result. 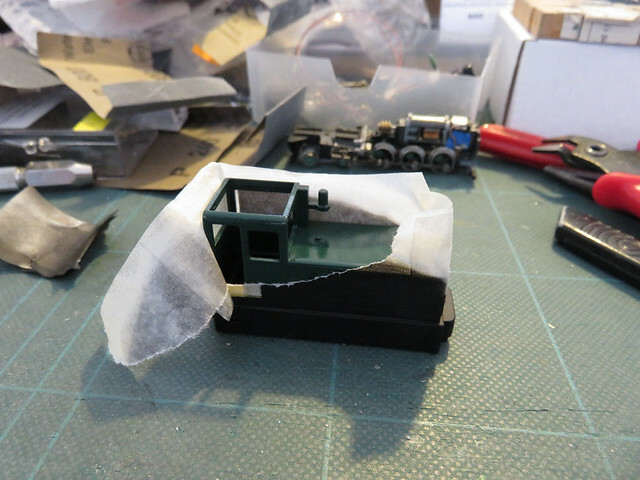 It helps that the break is between body and footplate so lining up the tape straight is easy, and there's little chance of bleed under the tape. 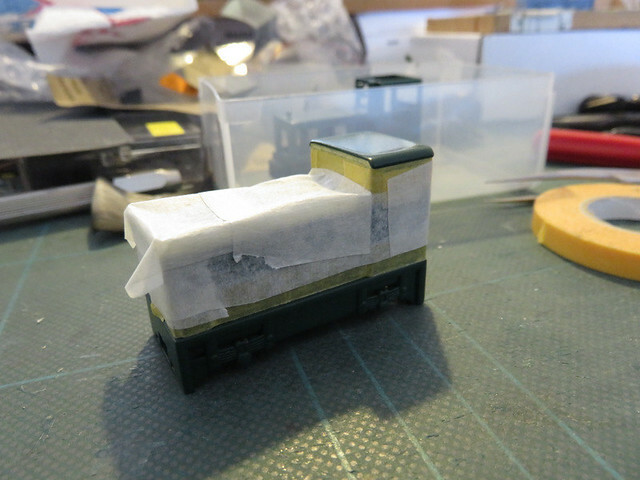 I used Tamiya tape (yellow) for the edges, which sticks well with a clean edge but low tack, and "domestic" masking tape for covering the bulk of the model in between. After spraying a few coats of Halfords black enamel, the exciting bit is peeling back the tape! 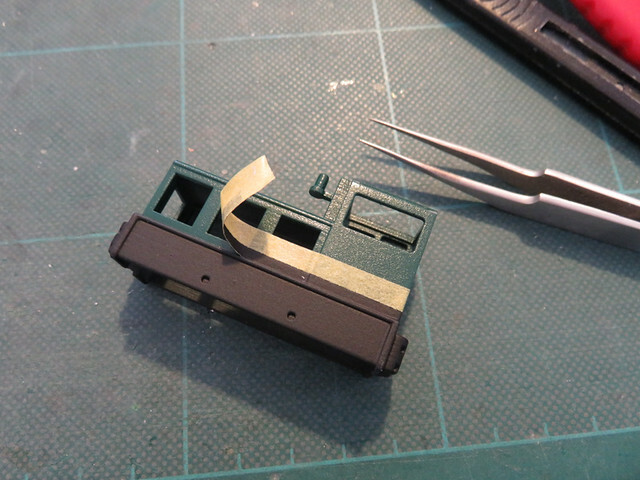 The Tamiya tape was carefully pulled away with tweezers. I'm very pleased with that finish! You may notice I haven't yet fitted the etch components including the bonnet sides, I thought it might be easier to paint this way. The etch has been blackened, primed, and painted separately. Urban Transport - With a difference! Back in May half-term we had a holiday in Italy, and made a couple of day trips into the nearby city - Venice. Everyone knows Venice is an unusual city in having canals instead of roads, and you probably picture the stereotypical image of the traditional Gondolas in a serene setting. Of course the truth is a busy and sometimes congested city - which as someone interested in transport generally, I found quite fascinating. 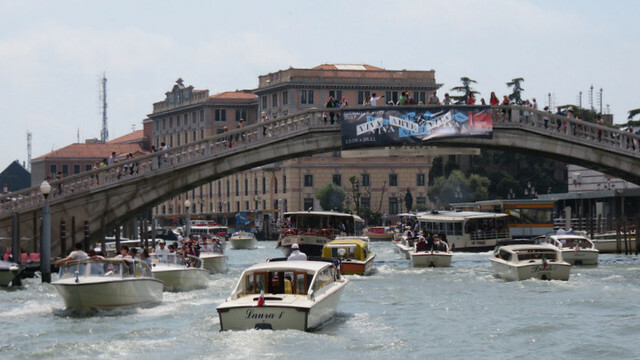 Here's the Grand Canal - the main thoroughfare of the city - right outside the station (far right behind the bridge). 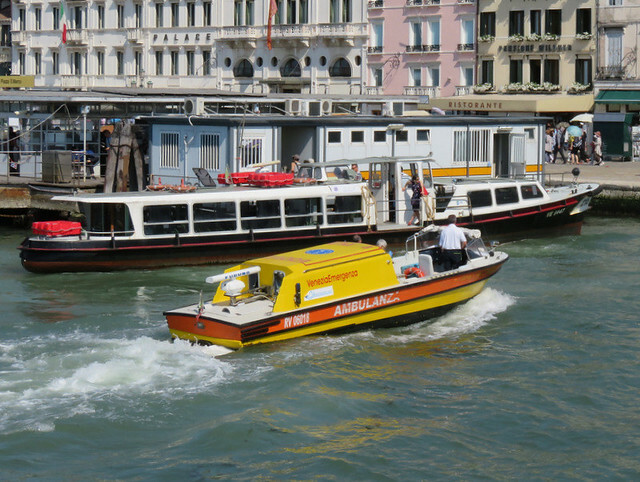 I can't see a Gondola, but there are at least 10 water-taxi's visible, and three Vaporetto's - these are the water busses, the public transport system of this city. The one outside the station to the right is just departing from the bus-stop, the yellow and grey shelter on a pontoon. I'll come back to the yellow craft in the centre later. 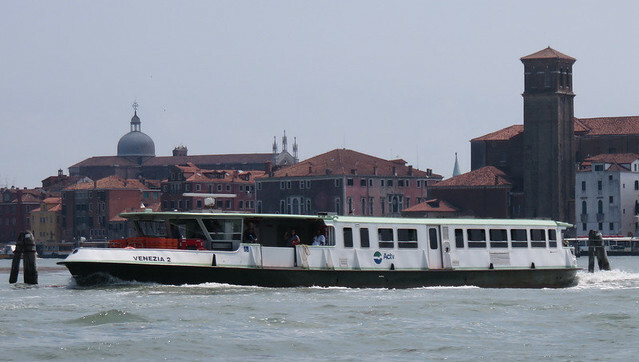 Here's a typical Vaporetto that would operate on the Grand Canal and to nearby islands. 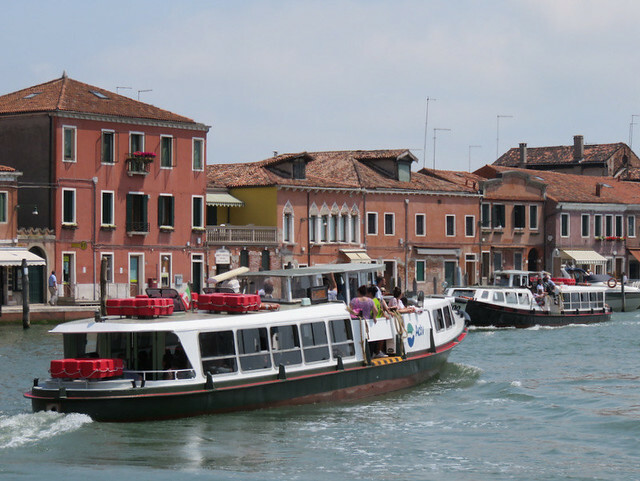 The Vaporetto's are the Underground system of Venice, albeit with a better view, providing a frequent service through the city and the "suburbs" around the wider lagoon for residents, and tourists too. This one holds over 200 passengers, the large gate behind the driver's cabin allowing commuters to board and leave the craft quickly at the stops, which have near-level entry platforms (floating) and modern electronic ticket systems. Routes are numbered and colour coded, with a London-Underground style schematised route map, making travel around the city easy. 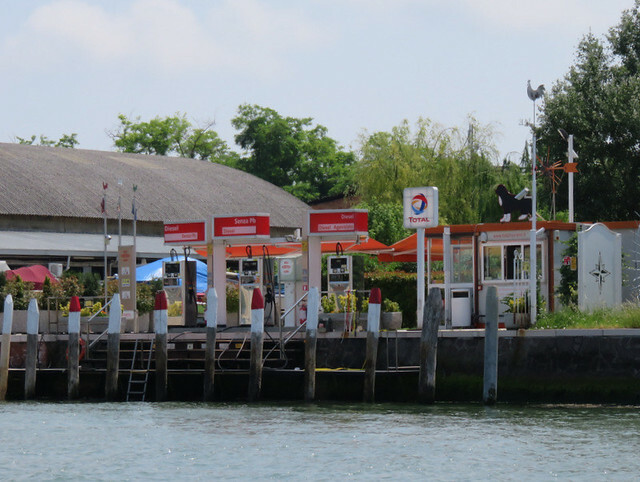 Here are a couple of smaller Vaporettos passing in Murano, an adjacent island, which operate the less busy routes and use narrower canals. I think they are more attractive boats though they are still highly functional, with the wide gates and standing areas. Meanwhile much larger boats operate the commuter routes around the lagoon, up to triple-deck vessels carrying 900+ people as we used to get into the city. 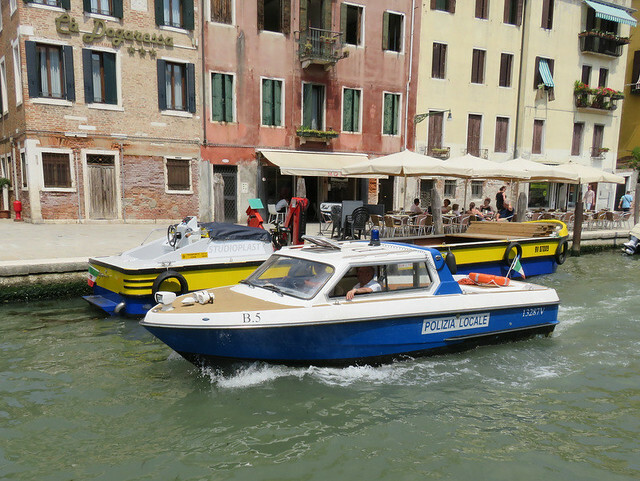 The water taxi's are all to the same, elegant design. The driver (is that the right term?) is up front where passengers can board, there is then a comfortable cabin and behind that an open deck. 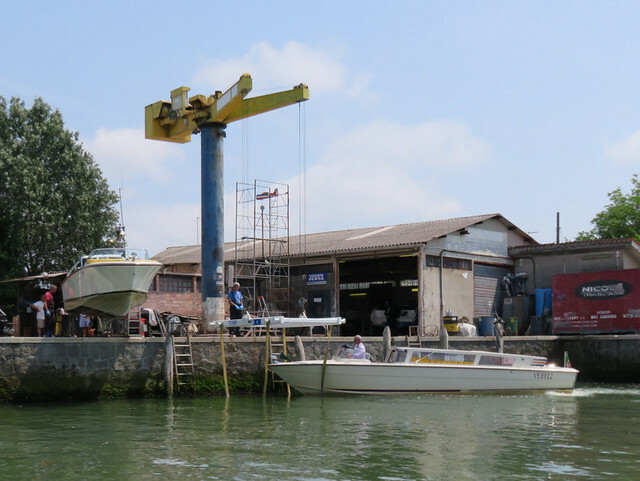 Here I spotted a boatyard with one out of the water, while the one in the foreground is entering the strops used by the crane to hoist them out. Here's another delivery barge (with it's own crane) being passed by a police boat - of course in this town the police must use boats too! It has a blue flashing light and siren horns on the bow, with a powerful headlight. I wonder if they have a radar gun? 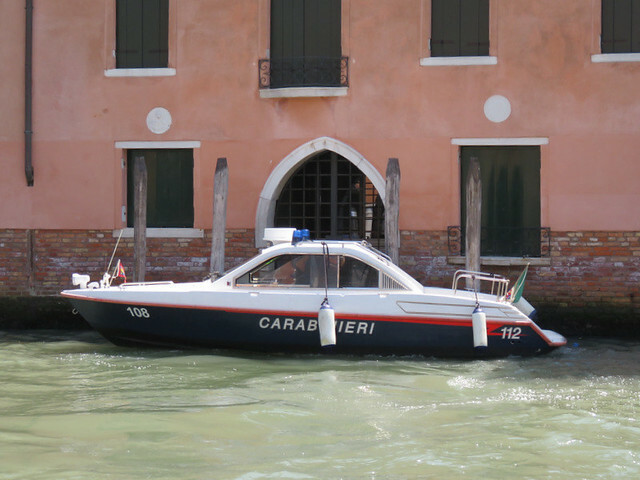 The police aren't the only emergency service that use the canals, here's an Ambulance (there was one in the picture at the top of the post too). It's fully equipped with medical staff, sirens, and a radar, and certainly seem able to travel at quite a pace. Oh, and where do you go if you run out of fuel?